Now, what with being Australian and all, I don’t follow US politics very closely. Obviously I am aware that there has been a hotly contested election, and that Barack Obama has just won his second term as president. With my limited awareness, Obama seems progressive and socially conscious, intelligent and well-spoken, caring and compassionate. Mitt Romney, on the other hand, is… Jesus H Tapdancin’ Christ, he’s a Mormon. If he actually believes everything Mormons are supposed to believe, I can only conclude he’s got the intelligence of a retarded gnat. I know that he and his party are apparently violently opposed to the equality of women and the whole concept of ‘family planning’ – namely contraception and abortion. With these vague ideas in mind, I can only suppose that Romney’s supporters are fairly right-wing, conservative, and religious. 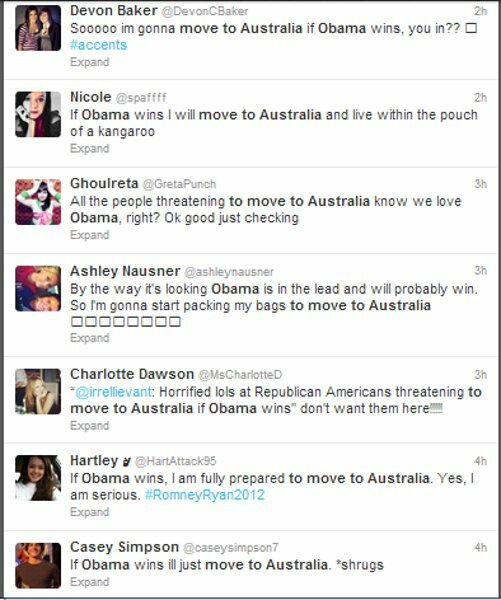 Why, then, are so many of them now professing a desire to move to Australia now that Obama has won? Are they unaware that our Prime Minister is female, an Atheist, and unmarried? Do they know nothing of our gun control laws? Have they no idea how easily available contraception is here? How socially progressive we are? Our health care system? Our religious apathy? Our multicultural nature? Or have they just picked Australia because it seems so far away in every respect? Does the distance, to them, mean we must also be politically different? Backwards? Old-fashioned? If that is a Republican’s perception of Australia – that is, if they haven’t updated their knowledge base in seventy-odd years – it only serves to confirm their lack of intelligence! In short – Republicans, we don’t want you, and you wouldn’t be happy here. Stay put, or maybe move to a warzone. This entry was posted in In The News and tagged america, australia, democrats, election, obama, politics, republicans, romney. I have NO IDEA what this moving to Australia thing is all about. Well, some people are gonna get schooled bahaha. Very out of left field. I think it says it all, though. They’re that ignorant that they actually think Australia would make them happy, based on their belief systems and political views. Hilarious. I know this might seem like a weird (and admittedly not deeply researched) connection to make, but I believe Romney winning would have paved the way for conservative, right wing views on all the issues you outlined above to shine in Australian parliaments. Like it or not, American politics do affect Australian politics. Also, on another note? Would these people be coming by boat? Do they know “we” don’t like that? Still laughing and shaking my head. I mentioned to my husband the same thing – that American politics have that impact here – and he pointed out that we don’t usually go BACKWARDS like that… we follow them in a lot of social ways, but just you try suggesting in Australia to limit access to contraceptive pills, we’d lynch the politician who said it! We are more progressive in many ways, and we do tend to keep that forwards motion, thank goodness! Your husband has a good point – a great relief really! we’re talking americans, they don’t even know where it is. but danger, danger, they may end up in austria and I definitely don’t want them here.